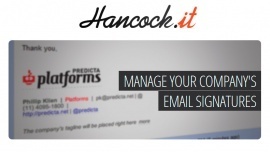 It is a way to super charge your company´s (Gmail) signatures. your daily emails an effective promotion vehicle. Tell your clients about what the media is talking about your company. Talk about events and where your company will be present. Promote job openings. Let specific recipients know that you are hiring. You also get access to an admin section where you can track emails and links. It is currently free, but we want to transition to a freemium subscription model. We already have a landing page but I will attempt to create a new one based on what I learn in this class. If you have any ideas or comments, please let me know!